First we explain that God loves you and wants yo to experience His peace and life, abundant and eternal. People need to know that God loves them and He has a real plan for their lives. Many believe they are born to live and die without purpose. Only God can give this peace to you. He does this when you have a relationship with Jesus Christ. Do you believe in Heaven and Hell? There are several scriptures which validate this in the tract and we usually read one of them to the individual. For example: John 3:16 says ‘For God so loved the world that He gave His only begotten Son, that whoever believes in Him should not perish but have everlasting life’. 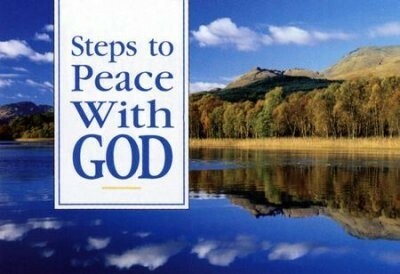 Being at peace with God is not automatic, because by nature you are separated from God. God made mankind and equipped us with the ability to choose. With those choices come consequences. Adam, as the first representative of the human race, chose to sin. 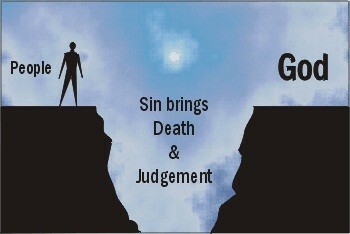 Sin entered the world and at that time Death entered the world. 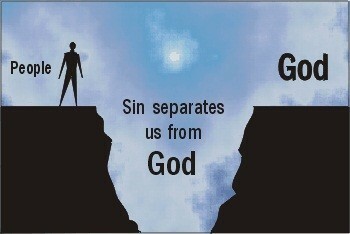 As soon as sin entered the world, man was separated from God. The entire human rice went from innocent or sinful in that moment. Romans 3:23, NIV says ‘All have sinned and fall short of the glory of God.‘ Romans 6:23, NIV says ‘The wages of sin is death [separation], but the gift of God is eternal life in Christ Jesus our Lord. We can choose to stay separated from God or choose abundant life with Him. Many in this world today see the separation and choose to deal with the problem on their own. They believe that by being good, moral, upstanding that they can make it to Heaven on their own. He nailed our sins to the Cross. In that day and still today there is an act of ‘cancelling debt’. When someone’s debt was cancelled the document which created the debt was stamped ‘Paid in Full’. THis is true today if you pay off your home mortgage or another note you may receive the original copy back stamped ‘Paid in Full.’ The debt is then cancelled. Our debt has been paid once and for all! You cross the bridge into God’s family when you receive Christ by personal invitation. This is not an invitation from Man. This is not the person who is talking with you bringing you to your salvation. This is the Holy Spirit speaking to you and Jesus calling you to come to Him. He is calling you to make Him the Lord of your life. To give your life to Him. To make Him the Center of your life. If you understand the Bible message as discussed in Steps to Peace with God, then you pray a prayer which includes these four main pieces. The words can and should be your own. If you don’t know how to word it, there is a sample prayer in the Tract. You must REPENT and be willing to turn from your sin. To walk with Christ in His righteousness. To turn away from whatever sin has had a stronghold on you. 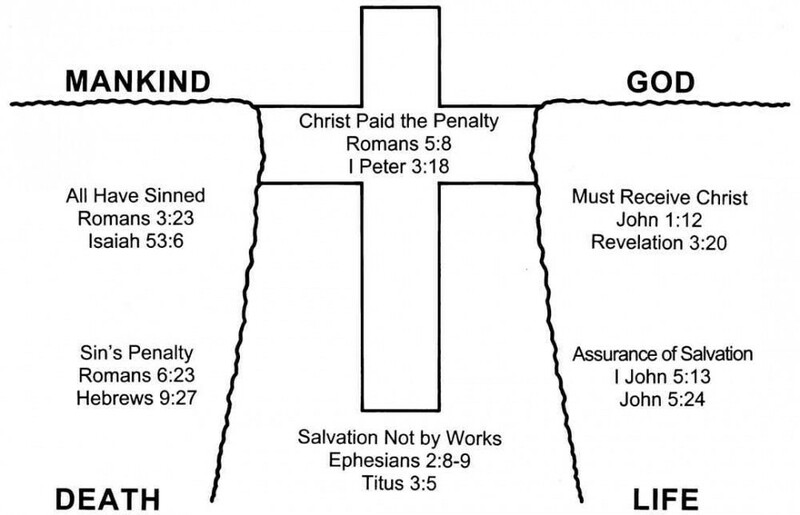 BELIEVE that Jesus Christ died for your sins on the Cross AND rose from the dead. 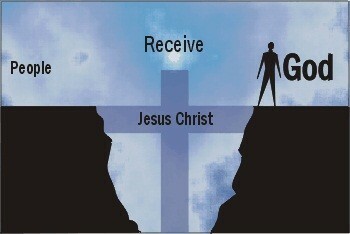 RECEIVE Jesus Christ, through prayer, into your heart and your life as Lord and Savior of your life. Accept God’s gift of eternal life. When Christ comes into your life, He may change your life in ways which may be uncomfortable, as He transforms your life. You prayed the prayer. You are committing your life to Christ. So what just happened? 2) You are a child of God. You became a child of God when you received His Son as your Savior. 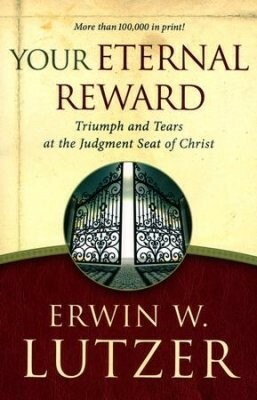 The tract has several items which you should always mention to the new Christian as steps going forward. They should never just be sent away with no direction as to the next steps for them as a believer. First I will tell you the steps from the tract and then I will add my own remarks. 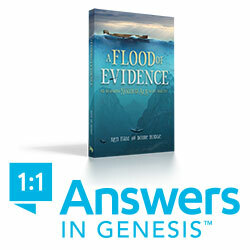 Join a Bible Study Class in your Church. Get connected with other believers. It is very important to fellowship, worship, study and pray with other believers. Commit to a quiet time each day with the Lord. Study His Word and Pray each day to draw near to Him and to hear from His Word and have quiet where you can hear from Him. Baptism is an illustration. Baptism by immersion best illustrates the death, burial and resurrection of Jesus Christ on our behalf and our subsequent faith in Him. It is not necessary for salvation but is strongly associated with salvation, as it illustrates our new identity with Jesus Christ. 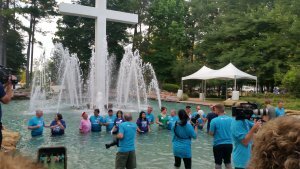 Believer’s Baptism: A person must first exercise faith in Jesus Christ, believing that He died for their sins, was buried and rose from the dead. An infant or person who does not understand God’s plan of salvation cannot make that kind of commitment. The Scriptural order is belief first, followed by baptism. Baptism is limited to those who have personally believed in Jesus Christ as Savior. We don’t press a new believer to be baptized although we do ask when they want to be baptized. It is a Profession of their Faith in Christ and should be done when they are ready to make the Profession. I believe that what is missing many times for the new believer is someone guiding them as to what their new life in Christ should look like. Many times people are invited to church, a bible-study, a beach retreat, a women’s Christian event, and they go and they hear the Word and they feel the Holy Spirit moving them to accept Christ. They want to have what they see these others around them have. They go forward and accept Christ and then the event is over and they go back home to their worldly job and worldly friends and family and POW the Enemy immediately attacks! Their family and or friends make fun of them. They tell them they have been tricked. They push them to go out and get drunk or do drugs with them or watch sexually explicit movies with them. The person falls right back into the rut they were in. They have to be told that they should be expecting the attack. They need to feel free to call the person who witnessed to them or be given the phone number of someone in the church to call when they are being bombarded by the Enemy’s temptation to turn back to their old ways. I feel that this is where the church fails is following up with the new believers. Encouraging them to come to worship and to Bible study and get acquainted with others who will become their support group. It is not easy as a new believer to stay on the path they want to follow. It is hard at times for those of us who are long time believers. We should not leave these new believers out in the lake without a life jacket. Yes they have their new found Faith but it is weak. It takes all of us caring, loving, praying, and helping the new believer to grow strong in their new found Faith. 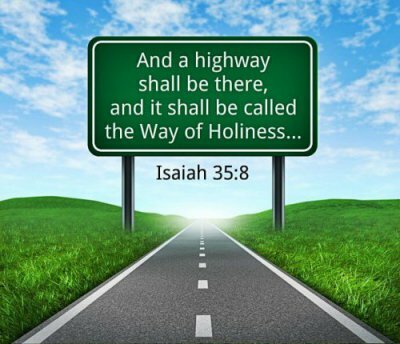 As believers we MUST abide in His Word. Staying in His Word daily draws us close to Him. 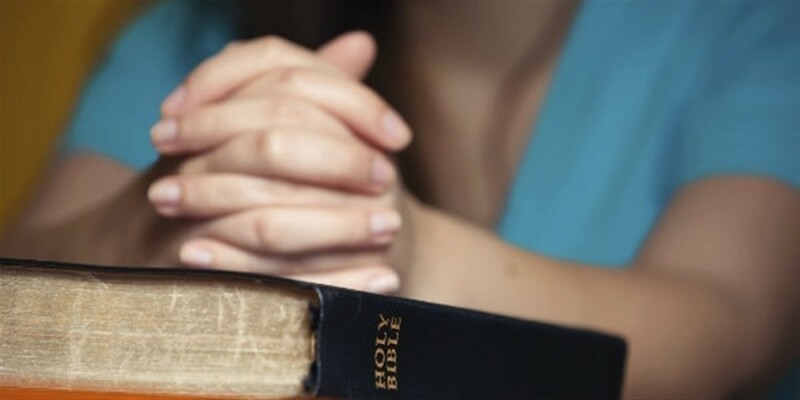 Go to a weekend Bible Study at your Church in addition to your daily study. Go to Precepts or MasterLife classes and dig in to the Word. The more you are in His Word the stronger you will become. Prayer. Breath prayers, long prayers, individual prayer, prayer with prayer groups, friends, other believers….Prayer is so important. Prayer shows your worship and adoration of the Lord. It shows your Faith and your Trust. Sometimes it just helps you to feel Him near. The chaos and busyness of today’s world blocks Him out. Get alone and spend time speaking to Him but also spend time just listening for Him to speak to you. Worship. Weekend Church is not just about the sermon. It is about Worship. Don’t just sit and listen to others singing. It is about you worshipping Him. Praise Him. Sing out to Him. It isn’t just about someone else’s performance of a beautiful song, it is about YOU being interactive and Worshipping your Lord and Savior and God! Volunteering. Serving with other believers is important as well. Jesus said He came to serve not to be served. If we are to follow Him and be His disciples we are to volunteer to help and serve others. And guess what the blessing is greater for the servant than the receiver in most cases. Be blessed! 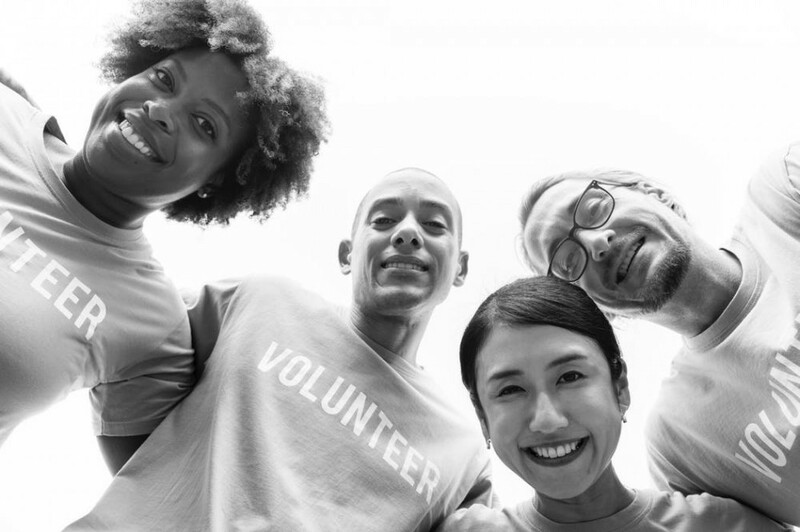 There are many ways to serve in your church and other organizations. Being a Christian requires ACTION. Many faiths believe that deeds come first before you can be saved. Christianity believes that the action of receiving Christ as your Savior comes first. Then doing the above actions as a Christian will transform you into someone who bears fruit and does good deeds as part of who you are in Christ. Loving others and bearing fruit for Him is what it is about. It will come because of your Love for Him and for others. Click on the picture of the Tract at the top to go to a site where you can purchase these tracts. If you purchase from the link we may receive a tiny commission. 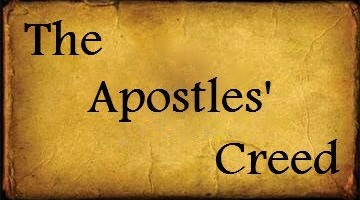 ‹ MasterLife Book 1 – The Disciple’s Cross by Avery T.Willis, Jr.